The pilot of the weight-shift control aircraft reported that he departed with 6 gallons of fuel and the estimated fuel burn was 3 gallons per hour. He added that, during the flight they performed multiple climbs and descents and he believed the aircraft burned more fuel than usual. He added that, about 1 hour and 15 minutes into the flight, the engine lost power. He restarted the engine momentarily, but then lost power again. He attempted to restart multiple times again, to no avail. During the forced landing, he attempted to land on a soccer field, but the aircraft impacted terrain about 15 yards short of the intended landing site. The aircraft sustained substantial damage to the fuselage. The pilot added that, after visiting the hospital, he went back to look at the aircraft and did not observe any fuel in the fuel tank. The pilot reported that there were no preaccident mechanical failures or malfunctions with the weight-shift control aircraft that would have precluded normal operation. KAILUA-KONA — One man was hospitalized Wednesday after the Air Creation Tanarg he was flying off the Kona Coast lost power and crashed at Kukio. National Transportation Safety Board investigators are expected to arrive on the Big Island today to investigate the incident first reported at 9:56 a.m. Wednesday. The Air Creation Tanarg carrying two men apparently lost power at about 3,000 feet and tried to glide into a grassy field near Kukio, the luxury development located north of Kailua-Kona, according to Hawaii Fire Department West Hawaii Battalion Chief Bill Bergin. “And, it just didn’t quite make it. Instead, it caught trees and tumbled in lava and ended up on top of a propane tank,” said Bergin, adding the tank was located near the Kukio Sports Complex within the Maniniowali neighborhood of Kukio. Ian Gregor, communications manager with the FAA’s Pacific Division, said preliminary data indicates the aircraft lost engine power shortly before 10 a.m. in the Kukio area, about 6-7 miles north of Ellison Onizuka Kona International Airport at Keahole. The Air Creation Tanarg had departed from the airport not long before. The pilot, who was identified only as a man, suffered a broken nose and facial lacerations in the crash, according to Bergin. The passenger, who was identified as a man visiting from Washington, refused medical treatment at the scene. Medics transported the pilot to North Hawaii Community Hospital for care. No additional information on his condition was immediately available. Though the plane landed on a 1,100-gallon propane tank, no leaks are believed to have occurred. But out of concern for safety, Bergin said fire rescue personnel quickly shut down the tank until a gas utility could arrive and assess it, and make any repairs, if needed. After getting clearance from the NTSB, fire rescue personnel removed the plane from the propane tank. Kukio was to secure the plane until NTSB investigators arrive today. The pilot of an experimental aircraft told witnesses his engine failed at around 3,000 feet, causing him to crash onto a rocky lava field about 6 miles north of the Kona airport Wednesday morning, a Hawaii County fire official said. West Hawaii Battalion Chief William Bergin said the pilot was attempting to glide onto a grassy field at the Kukio Golf and Beach Club, but landed 25 feet short. The pilot suffered injuries and was transported by Medic 14 in stable condition to the North Hawaii Community Hospital, Bergin said. His passenger, a visitor from Washington state, experienced dizziness, but refused treatment by medics, and returned by private vehicle to the Ellison Onizuka Kona International Airport, which is where the plane initially took off. The Air Creation Tanarg ultralight plane is owned by Jeffery Hoff of Honokaa, according to Federal Aviation Administration records. Kona Coast by Air is the company that operates the plane, and the pilot is not the owner of the company, Bergin said. 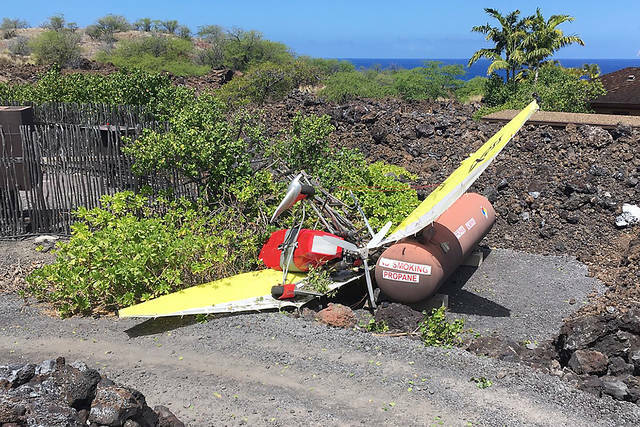 The motorized aircraft, with tail number N-912TJ, landed upside down, against a 1,100-gallon propane tank that services a kitchen used by the Kukio resort’s athletic club, Bergin said, adding that some gas lines were damaged. The FAA and National Transportation Safety Board officials will arrive March 27 to investigate the crash, Bergin said.